A Florida parent sent this email to TGP this week. 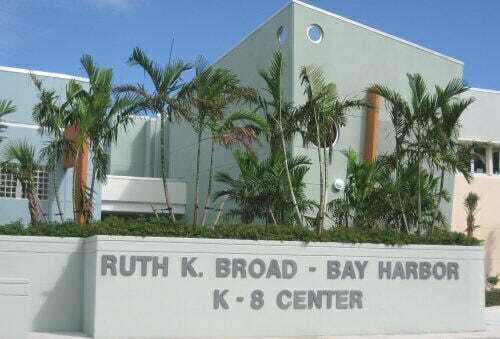 The Ruth K Broad – Bay Harbor K-8 administration sent a letter home with students saying kids who stand against the Second Amendment will be rewarded. The attached is an email I received today from my daughter’s school located in Miami-Dade County regarding participation in a video and sale of “never again” t-shirts. This is a public school. 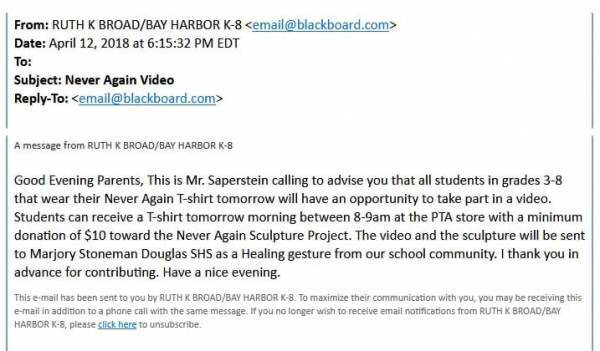 In my opinion, while the proposed sculpture is a nice gesture, it is not appropriate for the school to be apparently soliciting participation in a video and sales of t-shirts that seemingly have political undertones. I have not decided whether to address my disappointment with the principal. It is obviously a sensitive issue in my community. This is the type of garbage that is being promoted to American kids today. The post FL Grade School Rewards Kids with T-Shirts and Spot in Video If They Stand Up Against the Second Amendment appeared first on The Gateway Pundit.